The Lady Redskin Tennis Team competed in its first tournament of the year in a round-robin event here in Liberal on Thursday. Competing teams included Ashland, Perryton, Meade, and Scott City. New line ups, injury, and overall rust contributed to a slow start for the Redskin team, but senior, Susan Nguyen, impressed fans with a 4-0 first-place finish. #1 Singles ? 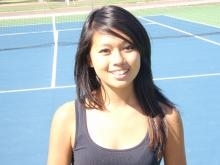 ?Susan Nguyen went 4-0 finishing 1st Place. She defeated Ashland ? ?s Aspen McCann 6-4, defeated Perryton ? ?s Lesley Garland 6-0, defeated Scott City ? ?s Brittany Berry 6-1, and won a close match against Meade ? ?s Landry Cordes 7-6 (7-4 in a tie-breaker) to win 1st Place honors. #2 Singles ? ?Kathy Nguyen went 1-3 on the day finishing 5th Place. She lost to Ashland ? ?s Joanna Reimer 1-6, lost to Scott City ? ?s Kathryn Buehler 0-6, lost to Meade ? ?s Devenie Borth before defeating Perryton ? ?s Tori Terhune 6-0. #2 Doubles ? ?Lauren Harp and Jacqueline Nguyen went 0-4 on the day after Nguyen turned an ankle and had to withdraw from one match. They lost to Ashland ? ?s Woodruff/Golden 0-6, lost to Scott City ? ?s Kucharik/Vasko 1-6, lost to Meade ? ?s Piteo/Flowers 2-6 before scratching from a match with Perryton due to injury. The next varsity match is in Colby on September 4th.